This entry was posted in Friday Fictioneers, Writing and tagged Connie Gayer, earrings, Friday Fictioneers, Hiking, lost and found, Rochelle Wisoff-Fields. Bookmark the permalink. Did she fall in that same spot last time they hiked? I love a story with a happy ending. Nicely done. I liked the feel of the yearly ritual. We have certain family traditions that never get old. I don’t know…but I lost a favourite earring – twice! – One time in the front lawn (found it by chance the following spring) and once it spent a year in the bottom drawer, came flying out when I took out a pair of shorts! I’m hoping to find an opal necklace Jan brought me from Perth. We’re both heartbroken and keep thinking it has to be somewhere around here. Another winner, Dale! I don’t know how you do it. Especially loved this twist of an ending! Inspired sort of by a true story! Thanks for your kind words. Life’s little ironies literally fall into place and face, so to speak. So happy to hear that, Randy! It pays to keep a delightful, loving routine! Nicely done. It does indeed, Alicia. Thanks! You are up late … I’m usually in bed by now, but watching a football game. It’s only 11 pm. I rarely make it to bed before midnight. I keep trying to aim for 11 but fail miserably most nights! … and now that I’m up … Woo hoo! You go, Frank! Wild Thing… should I put RRR’s favourite tune on for you? ha ha … not sure how much more time I have as the game seems to be in control by the good guys. The two of you are such good pals … tell her hello for me. off to bed … 55-24 with 6+ minutes to go … should be safe enough. Oh… I so wouldn’t! No seriously. I would believe it would be safe enough! oh yes … Shortly after I started watching it was tied at 14 … then it became time for the hammer. And it came down pretty hard! Oh yes … I actually have a tie to both schools. I grew up near the losers, actually attending many games during high school days … then went to college to the winners … it actually reminded me of the first game after I went away game … It was an away game, but I couldn’t return home to see the game … but it was a “who do I rout for” game of mixed emotions. That’s a lot of game there! But I know what you mean! but after my first home page, the colors officially changed. I can imagine her delight. So can I! I felt the same way when MY earring was found in the grass after a long, snowy winter! I am so glad you did, Deborah. Yeah, I’m with you on that one. Much more preferable to find it sans falling on one’s face! I wish it for you, Lily! Ha ha Courtney! I hope you do find yours! Thanks! Lovely story. I like the feel of it, and it seems to have exposed a common theme in lost earrings. I have a story like that too, but after its third instance of being lost, one of my favourite earrings hasn’t returned, and I fear never will. Thanks, Margaret. It has indeed! I fear the same happened to me! I got all excited because my son found the missing earring…and I can no longer fond the original one! Oh no – what rotten luck. Thanks, Irene. It was beyond lucky. Worth the mucky face, I say! Thank you for this sweet tale. I’m glad you didn’t push her off a cliff or stab her or something heinous. I like happy endings. Thank you, Tracey. I just can’t/won’t always go nefariously heinous! Besides… it was inspired by true events. No muck involved in my case, though… Me too. We need happy endings once in a while. That was an earring that was itching for reunification. Nice story Dale! They usually go the way of socks, don’t they? I have a complaint, ma’am. You don’t tell us how much he laughed when she landed face down in the gloop. Which was, for me, the highlight of your sweet tale. I’m with CE. That’s the first thing I thought of when I read that she fell. Oh, how hubby must have laughed. I bet it was! Ran out of words! Besides, if he was smart, he would have kept his laughter deep inside and out of sight! I was amused at your intro. While Ms. Connie doesn’t not blog, she is an avid Facebook fanatic. And you’re right, it’s a full time job for her keeping me between the ditches. We’re still looking for the other half of my brain. If you happen to fall into a muddy ditch (I promise I won’t laugh) and find it, please let me know. I am glad I was able to amuse you… I did note that Rochelle put the Facebook link up and was tempted to use it. Should I have? Maybe I’ll just have to friend her to help her out with her difficult job. Oh, and I so don’t believe you. You would not only laugh, you would snort and guffaw, I am certain! Feel free to reach out to Connie. The poor girl. I don’t know how she’s put up with me this long. Just by clicking on Rochelle’s link, Connie’s page is on my potential friends list… I just may have to now! I hear you, Robin! Usually it ends with a lot of embarrassment and no prize! Thank you, Ansumani. Happy you enjoyed. simply amazing that something lost could be found again. the feeling must be indescribable. Wonderful story. I’m glad you cleared up what the picture was. I thought it might even be the metal piece that holds the spur of a cowboy’s boot. 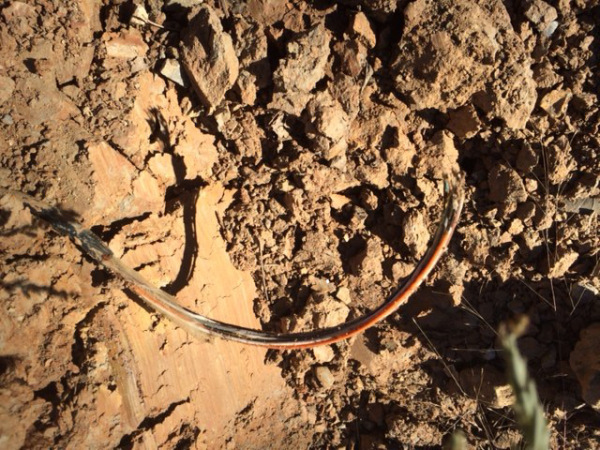 Actually, it is really telephone wire that was cut by graders! Isn’t it fun to see whT ee want to see? Ooohhh…that would have been an interesting take. YOU should write an FF! Ahhh, clever! I love finding lost sentimental items under mysterious circumstances! That is the best indeed, Solo!! I hear you, Sarah. It’s about the only thing that would have made it okay to fall face-first! It happens. My wife lost her wedding ring when surfing and five years later in a fish restaurant when she opened up this cod… actually that’s not true. Ha ha! You are a hoot, Patrick! This has provoked lots of lovely comments! A modern fairy tale of the lost and the found. Highly entertaining read. Just next time pull that husband into the mud too please. I will! Pull him in, that is! Cute story! You never know what you’re going to find. I’ve found contact lenses that were missing for weeks, go figure. There’s a purpose with every fall… And finding the earring must have saved the day. Ha ha!!! That’s a little extreme! If that was me Dale, I would have fallen face first in the mud and had the earring impale the side of my cheek! I am such a klutz at times! This little tale conveys a good message that hiking and jewelry don’t mix! Good! Who cares about a face full of mud anyway? Isn’t it good for the skin? Ha! Seriously though, you just make good use of your sleeve and carry on, right? Hope you have a great weekend, Dale! Exactly! Who cares? and Yes, make good use of the sleeve! A great and unexpected ending ! LOL. Sounds like something I would do. What a lucky ‘break”? Well done. A great idea! Now that is an OCD ritual!!! Nahhh… just going to back to a place they enjoy! Falling in the exact same spot… This did happen with my daughter with a cell phone she lost one winter. Great tale! Oh thank you, Joseph. What great luck for your daughter! It was a great blessing. A few days in a bag of rice and the thing even came back to life after a winter being buried in a snowdrift! Ah those missing earrings! We have had one of those turn up recently, unfortunately without the drama of a mudbath, which as CE says must have surely induced a stifled chuckle.